Ed. Note: This is the next installment of our Bicycles Are Business series. We are profiling businesses which incorporate bicycles into their services, or cater to their customers or employees arriving by bicycle. Our summer communications intern Max Hayes will be profiling these businesses and why, for them, bicycles are good business. If bicycles are integral to your business, let us know by contacting Max. The positives of large city living are many, but the proximity that makes city life convenient also has downsides. In the interests of efficiency, cutting costs, or conserving that most precious of commodities – space – smaller apartments often lack a washer and dryer. Some buildings have no laundry room on site at all. Apartment dwellers are all too familiar with the hunched trundle to a laundromat, bent by the weight of a procrastinated-upon dirty laundry pile. That’s where help rides in – on two wheels, no less. Founded by Gabriel Mandujano in 2010, Wash Cycle Laundry began with one bike and one trailer. Mandujano set out to build a business providing laundry services, dry cleaning, and linen rentals to Philadelphia residents, all by bicycle. He sought to prove that two-wheeled pedal power is a “commercially-scalable, economically-preferable, ultra-sustainable [alternative] to trucks for intra-urban freight.” Four years later, not only has the enterprise been a resounding success, it has recently expanded into the Washington, D.C. area. With over 30 employees, five facilities and two main markets, the pace won’t be slowing down anytime soon. The company is looking to expand into other markets, including New York, Baltimore and Boston. Such quick turnaround is one of Wash Cycle’s main competitive advantages. Customers schedule their orders via a website or by calling 1-888-611-WASH. A Wash Cyclist picks up the order (an in-person hand-off or customers can stipulate a secret hiding spot), cycles to a facility where it is washed (using locally-made detergents, high-efficiency machines and an all-green process), then returns the clean laundry in re-usable plastic bags 24 hours later. They recently launched same-day service options. Wash Cycle Laundry’s environmental impact is impressive. According to Goldenberg, moving freight within cities is responsible for close to a quarter of all carbon emissions generated by vehicles. 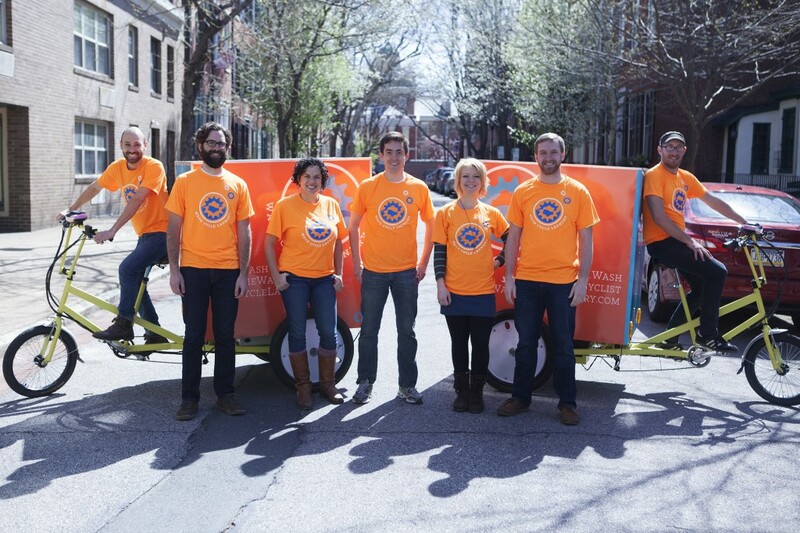 With its fleet of fourteen cargo bikes and trikes – picking up and delivering daily thousands of pounds of laundry in the Philadelphia and D.C. metro areas – Wash Cycle is not contributing one iota to that number. In addition, the money that would have gone into maintenance, gas, and insurance for those emissions-spewing trucks is free to go toward improving the business in tangible ways, ultimately resulting in a better experience for customers. For example, the company has just introduced a small fleet of electric-assisted tricycles that can carry up to 500 pounds, as opposed to the usual 300 recommended when their cyclists are using pure pedal power. The Wash Cycle team biked 160 miles from Philly to DC for the opening of their DC location, sleeping in campsites and bringing one of their delivery vehicles along for the ride. When they aren’t biking 160 miles down the Eastern seaboard, most Wash Cycle employees are thinking about cycling. “By virtue of working at a bike-focused company, cycling issues are very close to us. And many of us have bicycle-collection issues or treat our bikes like our babies. We show off our recent upgrades to each other with pride,” says Goldenberg. Wash Cycle Laundry is a shining example of the viability – and sensibility – of utilizing bicycles as part of a business model, and the company’s success and expansion is evidence that customers are increasingly choosing to patronize companies offering sustainable, local, and economical choices. For a limited time (through 09/01/14), Wash Cycle is offering $5 off first orders from Bicycle Coalition blog readers! Use the coupon code BCGP5 when you order online or over the phone! Got Some Clothes to Clean? Here's How! Check out the website to order, or call 888-611-WASH. The service, offering laundry and dry cleaning, operates Monday – Friday, 7 AM – 8:30 PM. Also check ’em out on Facebook. Pingback: Soak. Rinse. Spin. 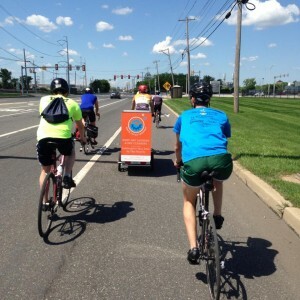 (Wash Cycle Laundry) | Bike Delaware Inc.